Encontrei 1 Hotéis em . Escolha a data de entrada e saída para ver os hotéis disponíveis em . Sem informar as datas, os preços com (*) são preços médios de cada hotel e nos arredores até uma distância de 50 km. Vila Da Barra Boipeba offers accommodation in Barra. Guests can enjoy the on-site bar. Each room at this guest house is air conditioned and is equipped with a flat-screen TV. Some units include a seating area where you can relax. Certain units feature views of the sea or garden. All rooms are fitted with a private bathroom fitted with a bath or shower and bidet. 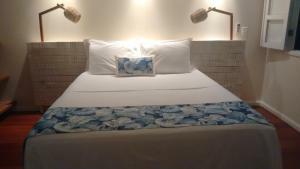 Vila Da Barra Boipeba features free WiFi throughout the property. A TV with satellite channels is available.